The Hindu (“India’s National Newspaper since 1878”) opened yesterday’s edition with agricultural news on the front-page. “Skyrocketing fertilizer prices floor farmers” was the title of the story about increasing costs of inputs. 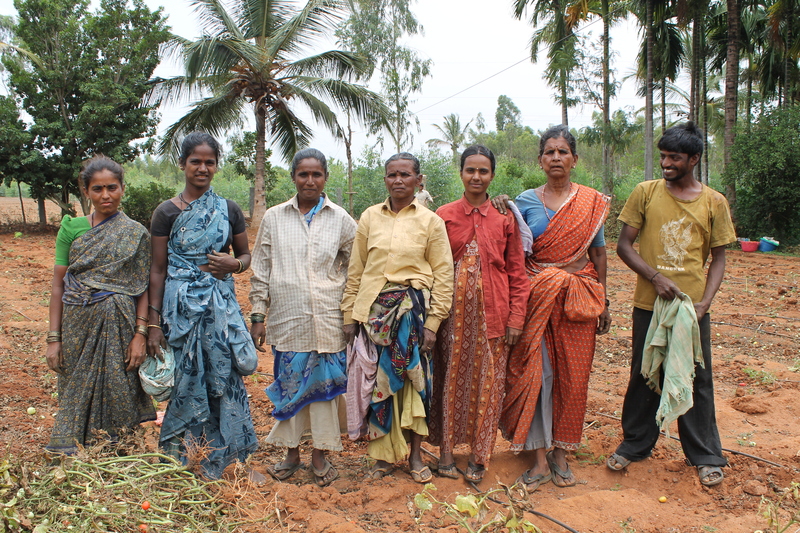 Small and marginal farmers, who constitute almost 80 per cent of the total of farmers in the State of Karnataka, has been hit hard by the skyrocketing prices of all fertilizers. The prices of most fertilizers doubled or even has gone up with over 250 per cent since 2010. It’s rather complicated why the costs are skyrocketing that high, but once again it makes clear how vulnerable marginal and small scale farming is for external costs. Going ‘organic’ or going for a maximum of ALEI (Agriculture on Low External Inputs) is the strategy that most of my colleagues at the UASB plea for, and they really ‘go for it’. Although a ‘top university’ in a scientific way (UASB is nr. 3 ranked of all Agricultural Universities in India), everyone I met so far isn’t just a ‘top scientist’, but also ‘a grass root worker’; very committed with the poor and the very poor, and always trying to find ways to help and to give mute people a voice or some kind of a future. I participated many seminars and presentations, and I did speak with many professors, researches and teachers. And they all touched my heart, because their heart was always with the oppressed and the poor. I had the opportunity to meet the highest person in charge (Prof. dr. Gwonda, the Vice Chancellor) several times, and every time I spoke with him, I was impressed by his commitment with the message and mission of his institute. To help the poor and the very poor; to empower the weak and the marginalized. 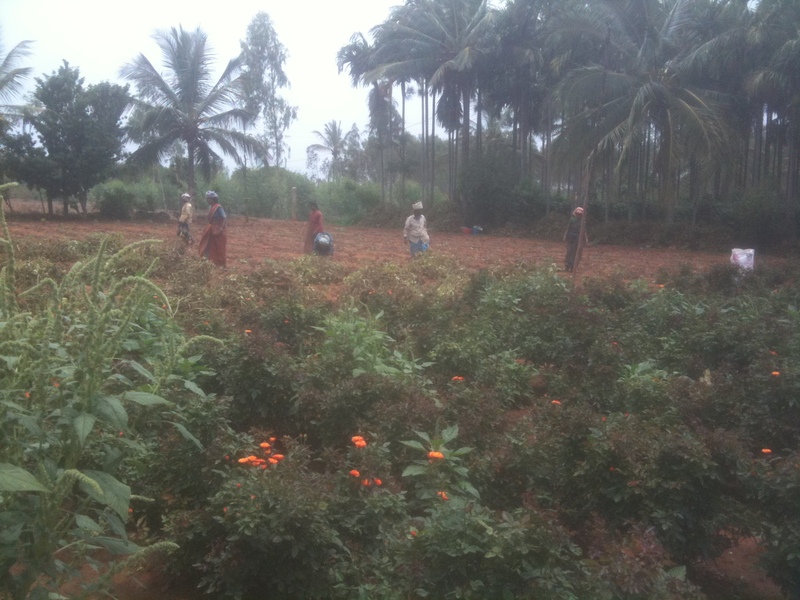 In ‘part 2’ I promised to tell more about ‘farming and rural life in India’. I have to break these promises. Like with so many other things in India, it is impossible to get a good idea about what’s really at stake. Remember the figures I gave you about the average spending in rural and urban India. They indicate wide spread poverty. But at the same time, India is worldwide nr. 1 producer of milk (17 percent of all worldwide cows & buffalo’s are located in India); India is nr. 2 in producing vegetables; the same score with rice; the same with fruit, etcetera. These incredible figures do impress as well. So I was thinking: where are these dairy farms, where are those orchards, where is the field with ‘sweet peppers’? Considering these things, I noticed that it is so hard to imagine what India really look likes. I flew to New Delhi and took some metro’s to get an impression of this city (I didn’t), and then flew to Bangalore to get dropped off at the campus just outside this enormous city. So what do I know? What have I seen? Some cows in the street, a bull near a Hindu temple. So nothing at all so far….. If you look at the figures, you hardly can imagine that India is ‘one country’. India is 100 times as big as The Netherlands, and the population over 80 times. So the whole of India has (in average) almost the same population density as Holland; can you imagine…. ? It has 22 States (India is a federation) and there are 17 official languages. Languages, that are completely different, and although Hindu is the official language (and many people do speak more or less some basic English), the coherence of this nation is rather fragile (not to mention the differences in religion: Hindu, Muslim, Buddhist and Christians). 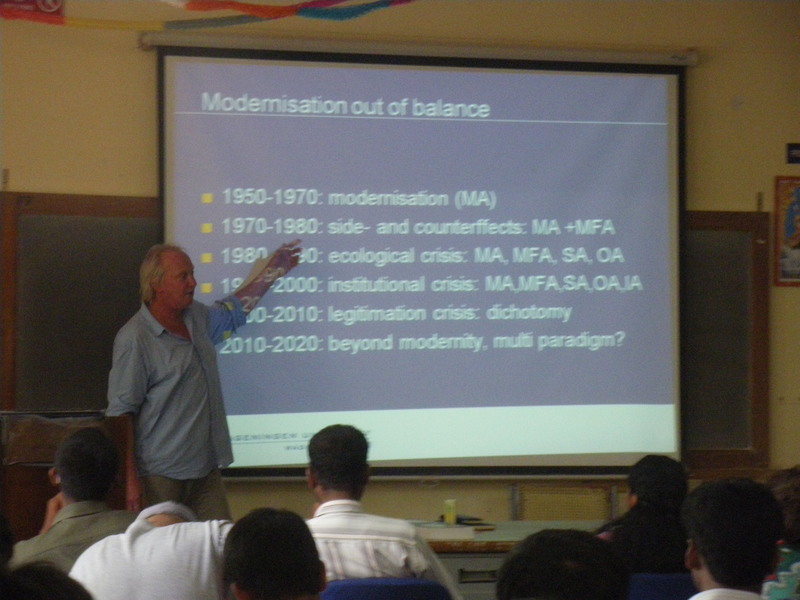 So what about ‘farming and rural life‘ (the title of one of our RSO courses at the WUR); is it possible to get any idea about that? 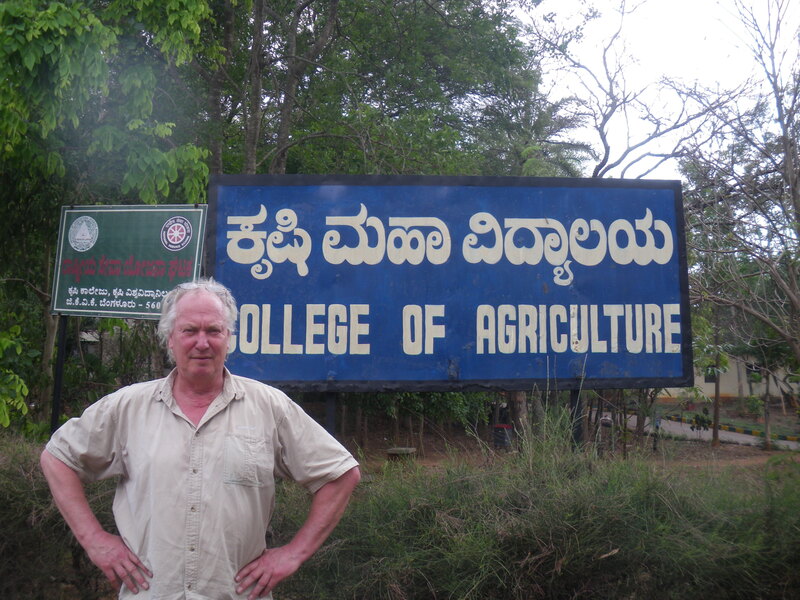 A week has passed since I arrived at the campus of the University of Agricultural Sciences Bangalore (UASB) in the State of Karnataka, South West India. A week that looks like month’s to me. But it is good to notice that things get more and more familiar to me. The first days of my stay were both overwhelming, depressing and exhausting. Of course because of the climate (37 degrees Celsius, and monsoon season just started), but moreover because of the culture shock that happened to me when I arrived in New Delhi and later in Bangalore. Although many things still are completely strange to me, I manage more and more to find my way around. After a week, English conversation with Indian people is not that difficult anymore is it was in the beginning (although sometimes…), and also I get a little bit familiar with the names of my colleagues at the USAB, like prof. Shivamurthy, prof. Krishnamurthy, prof. Subbareddy, prof. Gayathredevi, prof. Srinivassappa and prof. Nanjappa. Since I have my own little apartment at the International Students Hostel and an office at the Dept. of Agr. Extension, I can find my way and rhythm in this melting pot of many different experiences. Especially the daily walk after work to Sahakaranagara to do my shopping’s makes me feel at home. Because I’m the only western guy (which means: long, tall and very white) at the campus, people get to know me and so we have our daily talks and jokes. By the way, when Indian people pronounce the name of the quarter (Sahakaranagara), it’s sounds like a mortar fire: takkatakkatakka. Actually, that’s also the way many other names and words are pronounced: takkatakkatakka….